We oversee fourteen regional First In Families Chapters across North Carolina. The First In Families local Chapters offer support to families and individuals according to their self-defined needs. Examples of supports include computers, home furnishings or modifications, childcare or respite, or repairs to vehicles. Support can also be the connecting of an individual to vocational, social, and educational opportunities in the community; whatever it takes - for people to live and participate fully in their community. To respond to a particular need, First In Families partners with local businesses, citizens, and agencies. Sometimes we work to get the lowest possible price, or we might barter or exchange something. Other times we simply make a referral to an appropriate agency. As First In Families engages the community, relationships often develop. Through this process, the original need gets met, and the community becomes a richer place. A First In Families local chapter can support any family in which one family member has a developmental disability or delay, or is at risk of the same, or has a traumatic brain injury. Families or the individual must live in a county served by the Chapter and they must meet financial eligibility requirements. The residence must be a home, not a licensed facility. Families who have received help from First In Families often wish to help another family in the future. Examples of this type of 'circle of giving' include foreign language translations, or donations of labor or needed items such as furniture, car seats, computers and toys. First In Families values privacy, and individual family information is kept confidential. 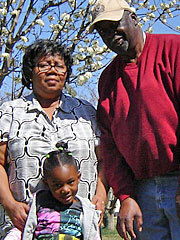 Photo description: family standing under a tree in their yard.